Water is precious and we all know that. But how many of us do really care about it when we are in bathroom? Yes, we are speaking about something that will surprise you all. Water touches every aspect of life, and in India uncertainty over access to and the availability of this basic resource may be reaching crisis levels. As India continues to undergo dramatic shifts caused by a growing economy and population, competing demands for this limited resource coming from households, industry, and agriculture have wide-ranging implications for the country’s future. A little 12-year-old girl from Nasik has invented a shower that will not only save water upto 80 per cent but will provide solutions to the scarcity of water issues in the country. An unique thing about her invention is - with the new smart shower technique in place, water could be supplied to the population of 17 lakh people for continuous 34 days. 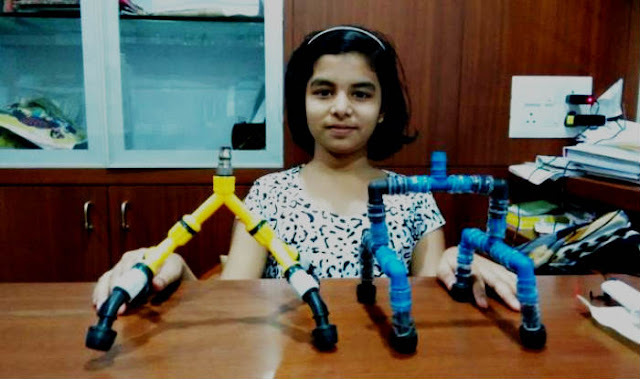 Shrusti Nerkar, a sixth standard student in Nasik’s Rachna Vidyalaya had invented a shower with special nozzles. According to Nerkar, with the new smart shower technique in place, water could be supplied to the population of 17 lakh people for continuous 34 days. Her invention has been recognised by District Collector Dipender Singh Kushwah who invited her to the office and requested her to demonstrate her innovation. Speaking to DNA, daughter of professor of electronics at the government polytechnic college Narendra Nerkar, Shrusti said that she got the idea to innovate such smart mechanism after visiting a car washing centre. She said that she was amazed with the fact that how with little water such a big car be washed. Soon after returning to house, she started working on the project and in the fifth attempted succeeded. The design was made with electric wire pipes and PVC pipes before finally settling for the fold-able pipes. Expressing pride with on the success of her daughter, Narendra said, “We have encouraged both our children to innovate. We have given them the freedom to learn and experiment.” Shrusti had applied for a patent for the latest innovation.